Camden, September 4, 1998. I had just returned from Florence, SC to see my brother after his near fatal auto accident. My friend witnessed a starved kitten, meowing, wandering alongside of Eckerds drug store, eyes matted, coughing and sneezing. Upon returning to my vehicle I was told to go just around the corner of the building for a friend there needed my help ASAP. There staggered a pitiful creature. Upon picking her up she collasped against my chest. We took her to vet Dr. Ronnie Fulmer, she went in to ICU for a couple of days. She lost sight in her right eye, the anibiotics worked on her cough. 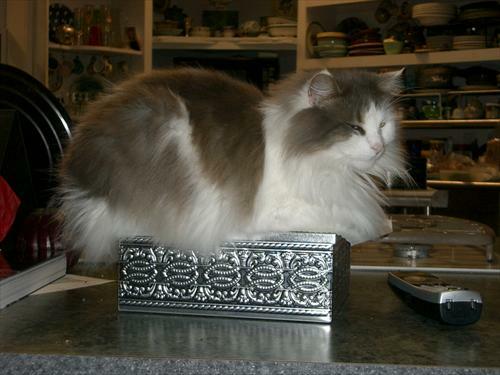 In a moment of grace a bundle of gray and white fur jumped on the counter as I was washing my face. She began swatting at the stream of water, then slid into the sink continuing to bat at the water. It was the first time in two weeks of brother rocking between life and death that I broke into laughter witnessing this kitten at play. Therefore her name, Illizaroth of Eckerds, for the contraption on my brother's broken leg and the place where she was discovered. She is now one of the studio muses and officially a Beauty Queen, laying claim to everything new in the house.